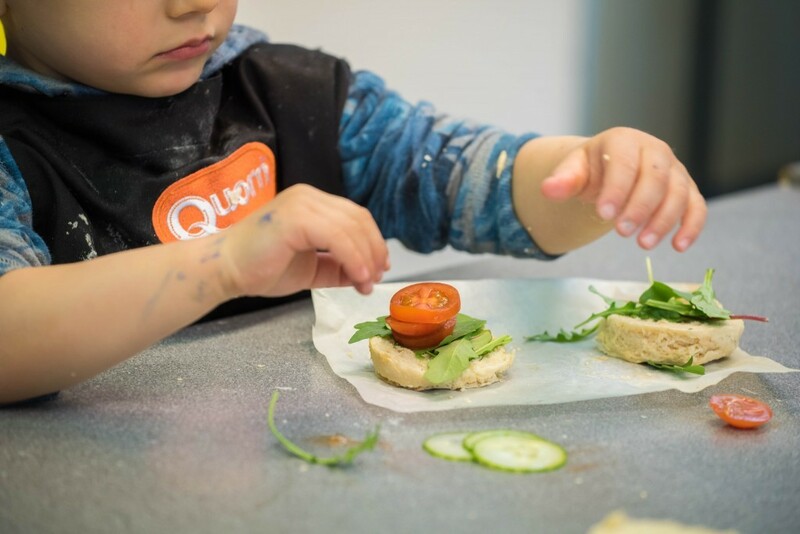 The boys and I massively love our food, so I had some glimmer of hope that they’d remain pretty open-minded about trying Quorn out for the first time at a cookery class hosted by the Kids Cookery School (KCS). 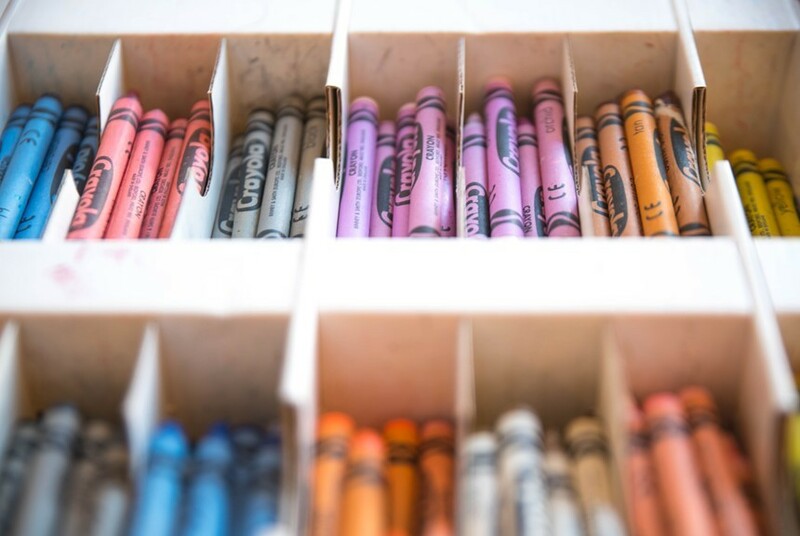 KCS is quite a unique school indeed! 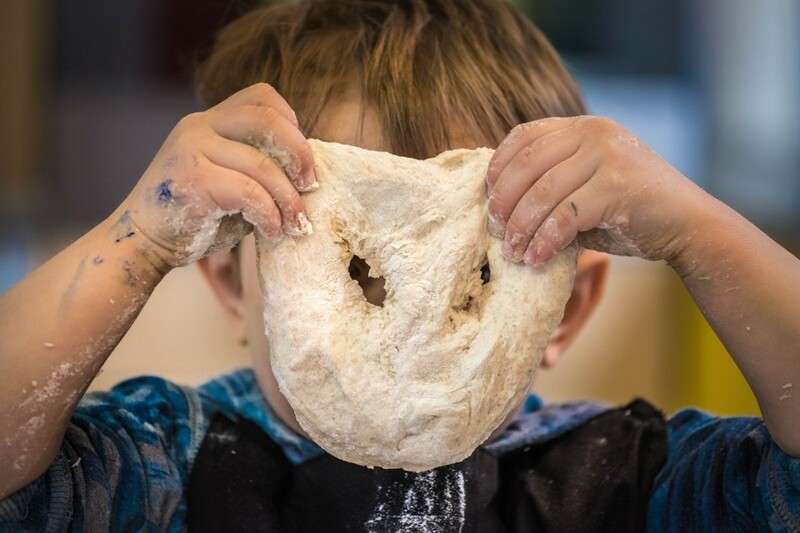 The charity aims to teach kids culinary skills that they can take away with them for the rest of their lives, as well as build on their palate, so that children are more confident in trying out healthy ingredients as well. 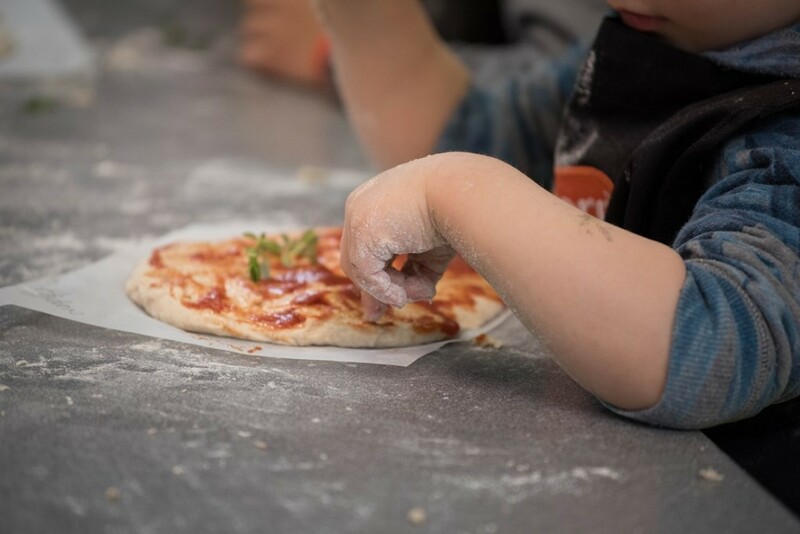 So, I enthusiastically accepted the offer to take my kids along to a cookery class all about substituting Quorn into every day children’s favourites like pizza and burgers. We opted to attend the morning session, as my husband was appointed as the professional photographer for the event and we were the first of the blogger families to arrive at the KCS in Acton. 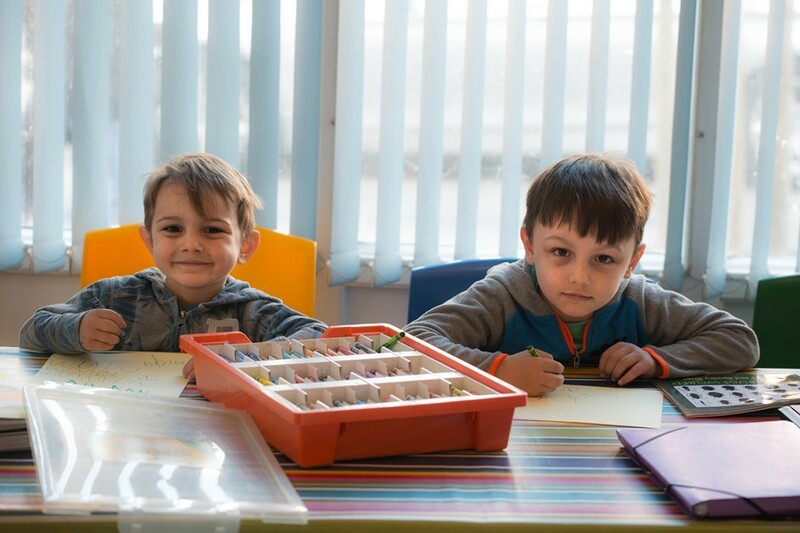 We sat in the waiting area and chatted to the Quorn, PR and KCS team, whilst the boys borrowed an impressive array of crayons, so they could create some pieces of art to hang on the KCS wall. 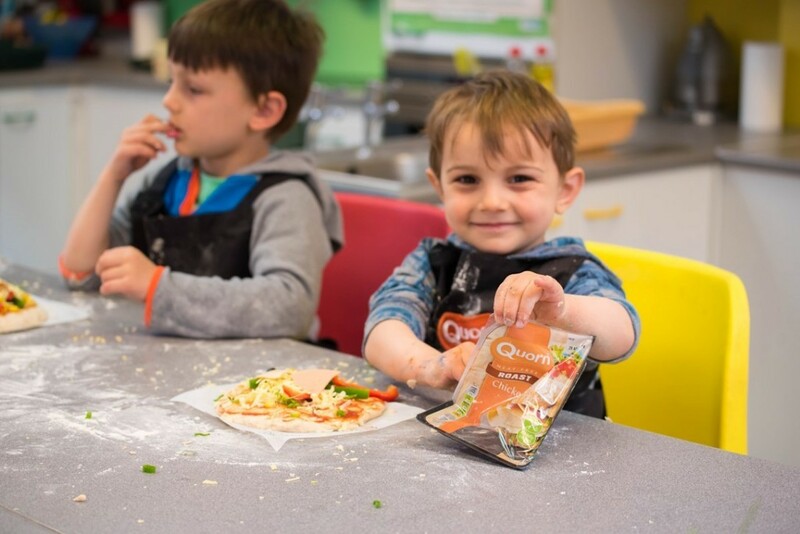 It was a special day for our little family too, as it was my little one’s 4th birthday, so Aidan was experiencing a particularly fun birthday of cooking Quorn meals for his family. 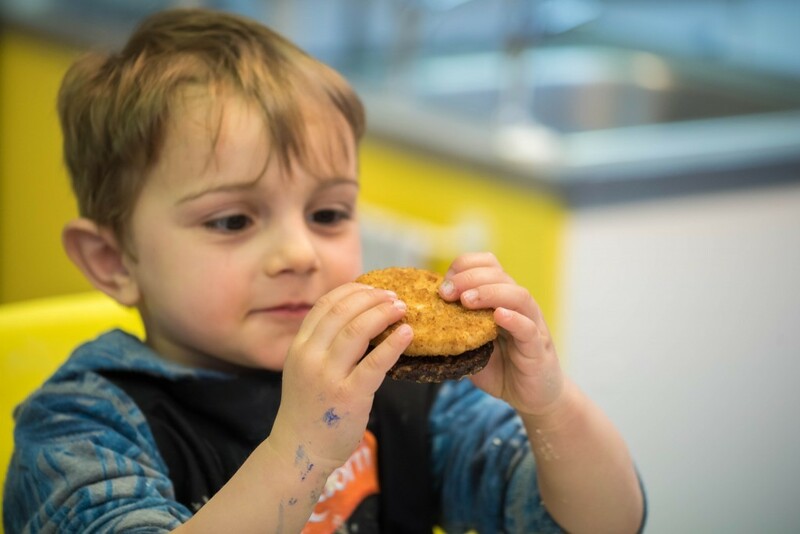 He had enjoyed a great sports party the Saturday before, so Aidan was quite happy to keep the birthday surprises rolling in. After half an hour, we realised we were the only ones attending the morning session, as most of the families could only make it to the afternoon. 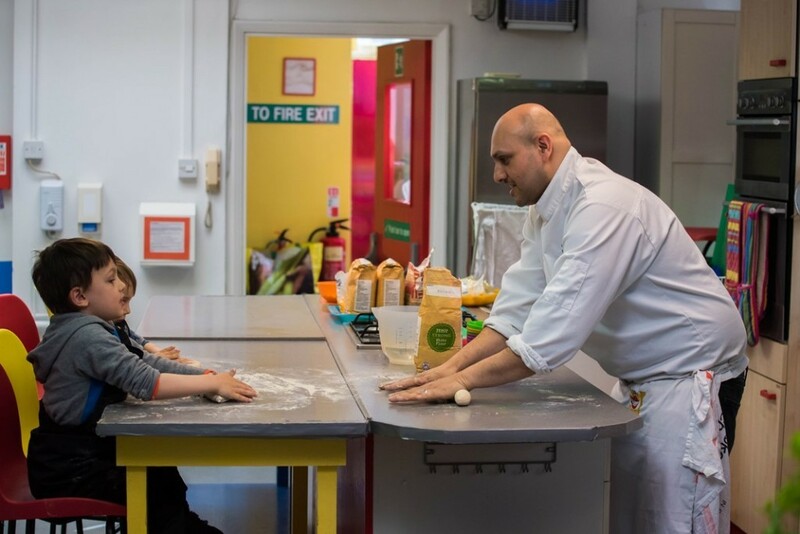 This meant that Aron and Aidan were going to receive a very special private cookery lesson from Chef John, the Head Chef, who really is super talented with the kids. 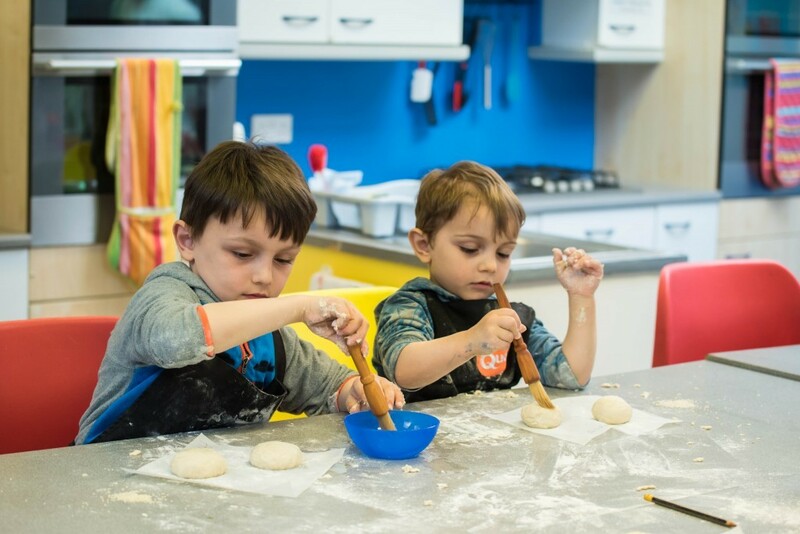 As we headed over to the kitchen area to get the boys started on making some delicious Quorn recipes, I could see Chef John and Chef Oliver busy preparing all the ingredients for the cookery lesson. 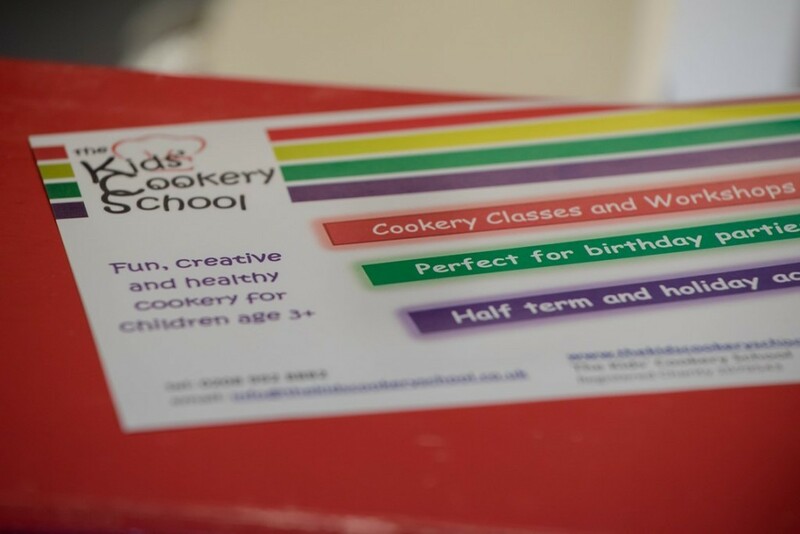 The kitchen was warm and inviting with lots of colourful and informative posters about teaching the children a little bit about the food they were cooking and how eating a balanced diet would benefit their health in general. 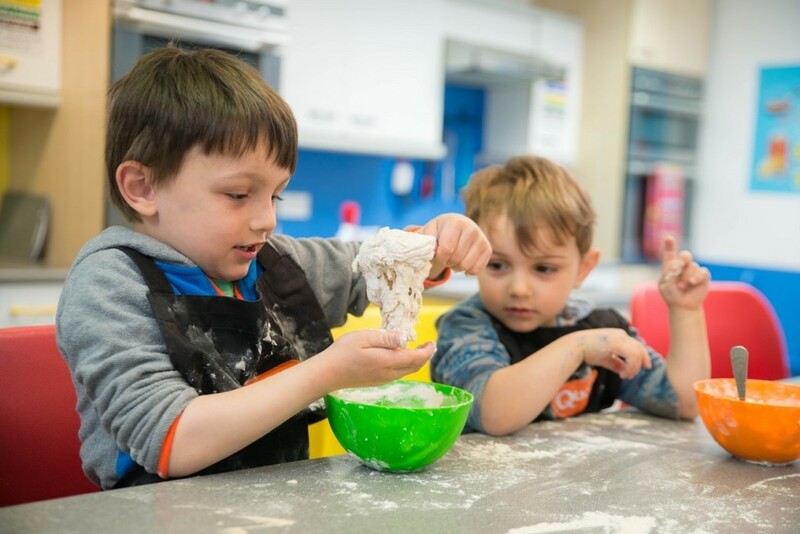 The KCS is a registered charity that aims to provide children and young people with the skills and knowledge needed to make healthy food choices for themselves. 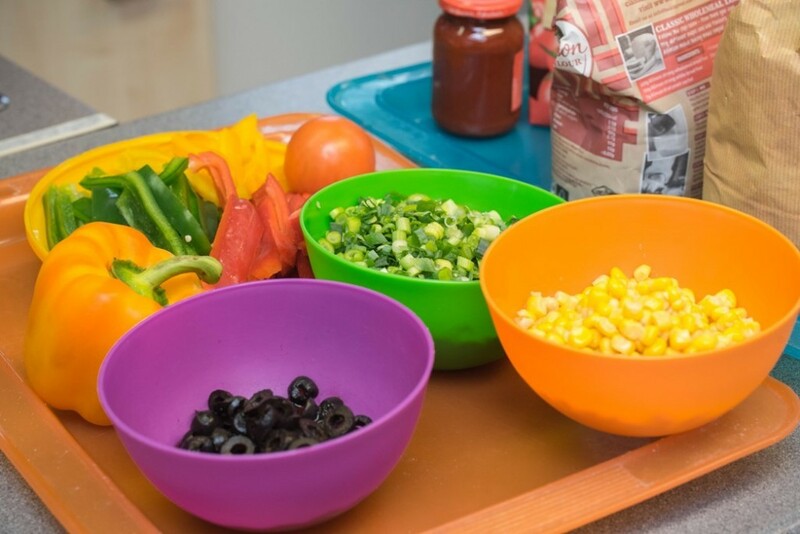 KCS teaches around 2,500 students each year on how to cook and eat healthy food. 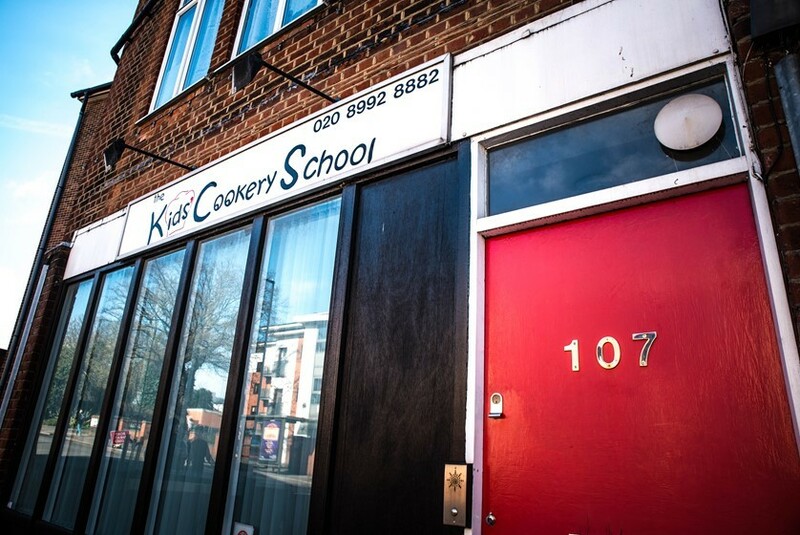 The kitchen is based in Acton, West London, where the majority of their practical cookery projects take place. 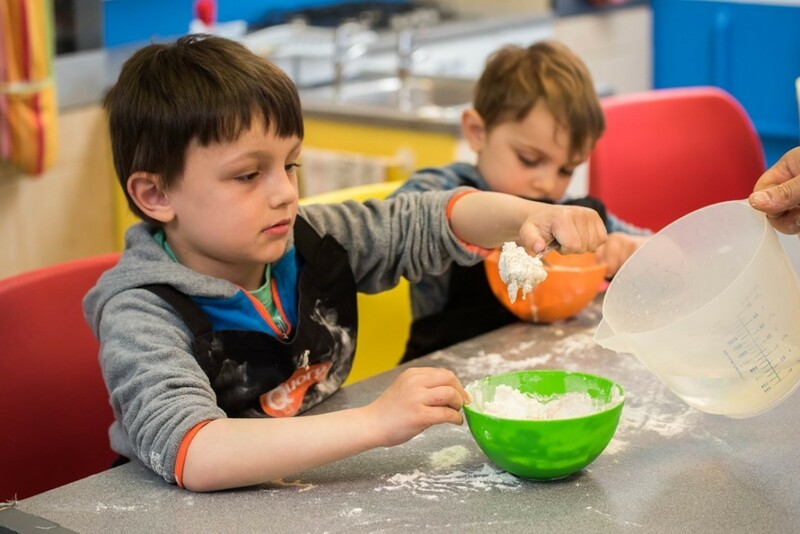 They’re so much in demand that they’ve actually gone mobile, so they can come to any school in the borough of London or at any other chosen venue within the vicinity. 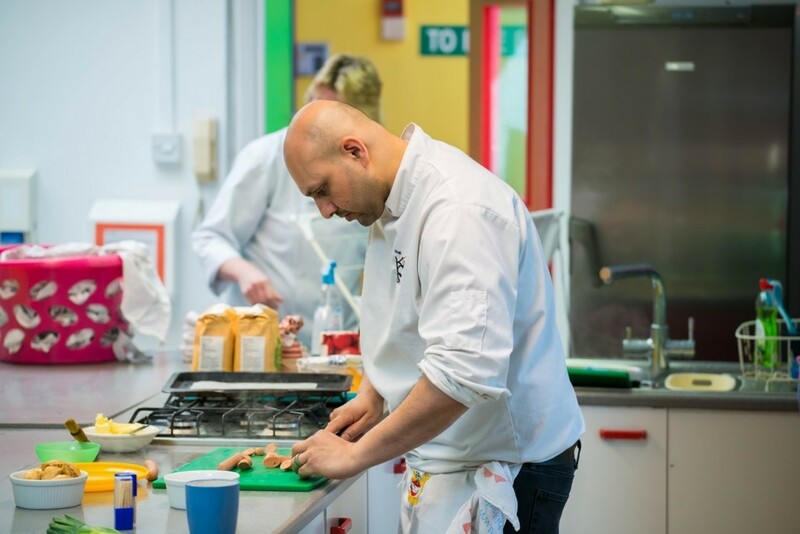 It’s great to see that they’re so enthusiastic and passionate about teaching children and young people how to cook for a healthier future. For more details on booking the KCS for any events, please visit their website here. 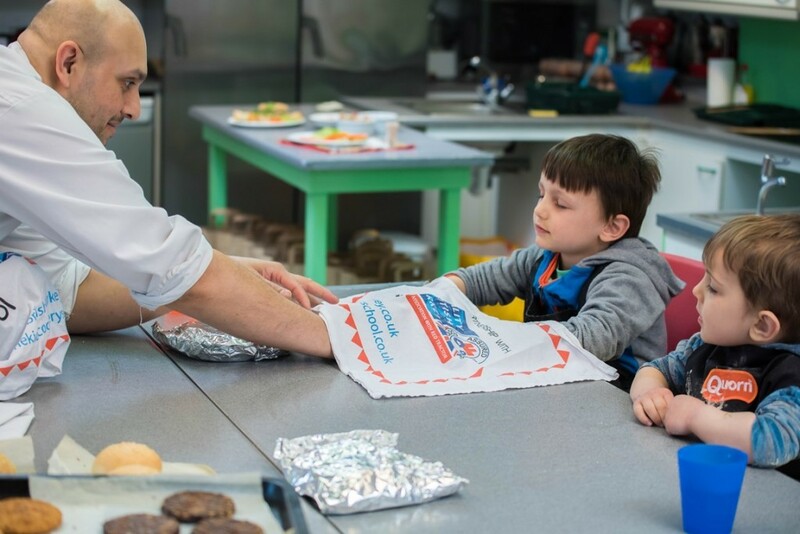 I handed the boys over to the very capable hands of Chef John and Chef Oliver, as I tucked into an impressive display of Quorn food dishes in the adult corner nearby. 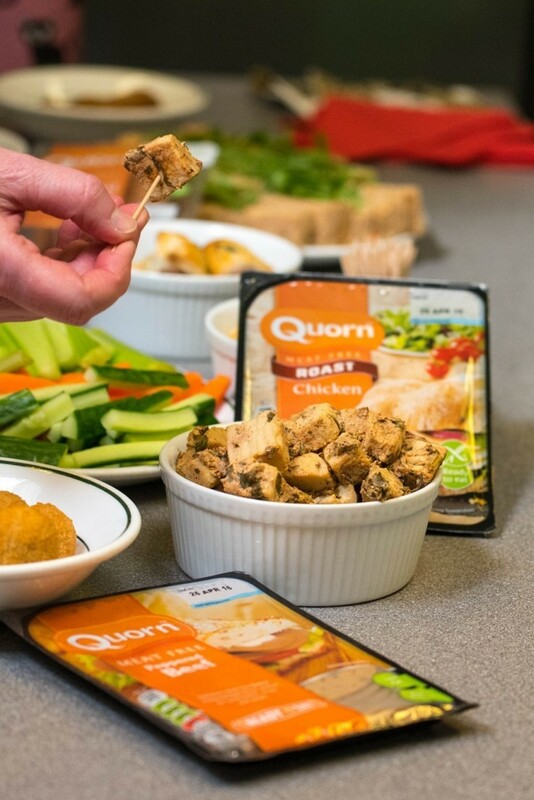 As a new lover of Quorn, I had no problem trying out all the different Quorn dishes on the table and, in fact, I actually found them all to be super delicious! 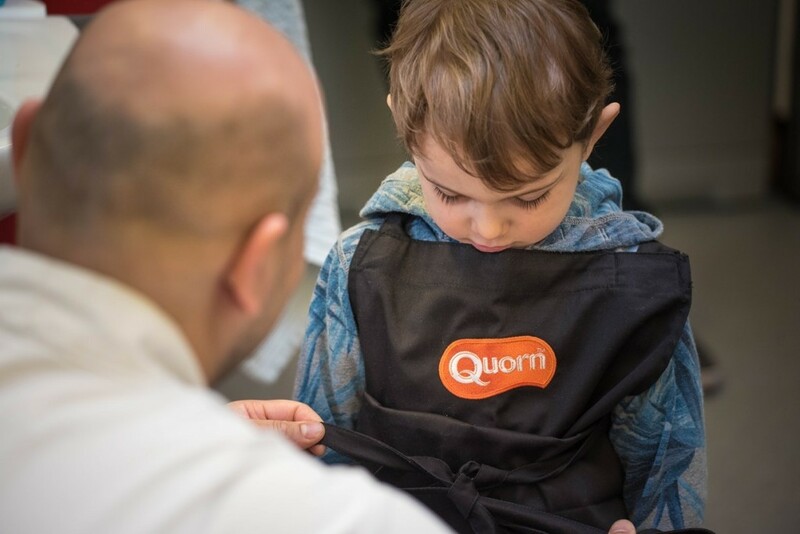 The boys sat down at the opposite end of the kitchen table to Chef John, donning a bespoke Quorn apron and freshly washed hands. 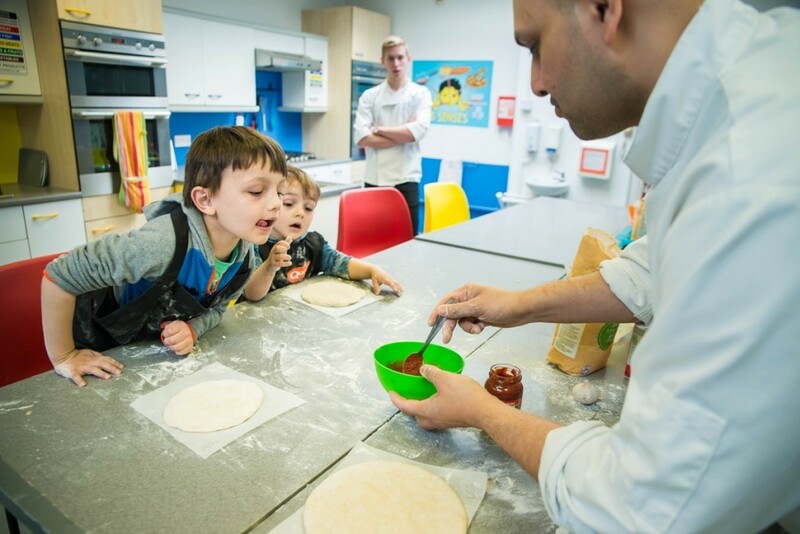 Chef John started the lesson by teaching the boys all about measurements (i.e. 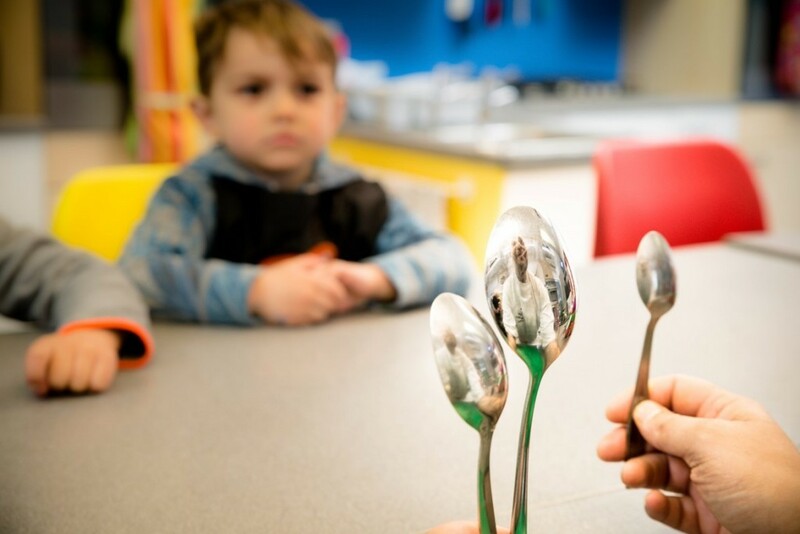 tablespoons versus teaspoons) and rather expertly engaged the boys on the importance of eating a 5-a-day diet of fruits and vegetables. 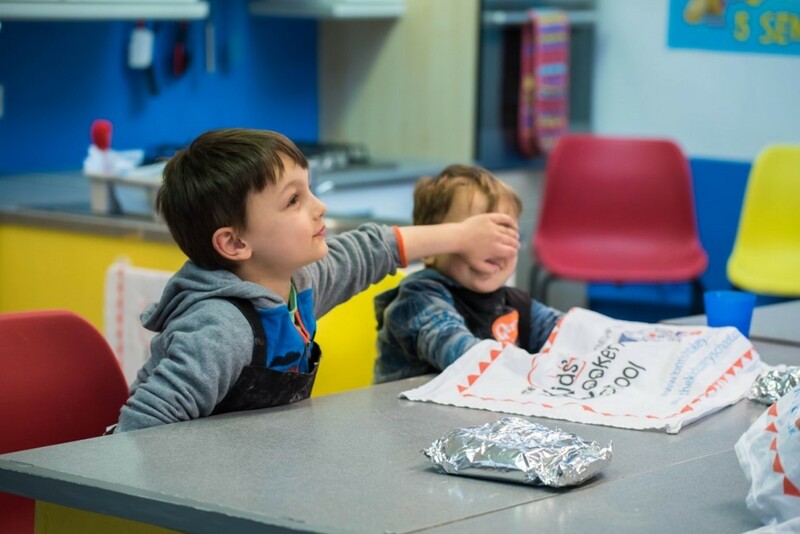 The boys then enjoyed a ‘fruit versus veg’ quiz, where they had to guess the fruit or vegetable hidden under a tablecloth and match them to their respective family. Aron correctly guessed the first item to be a tomato and Chef John challenged Aron to work out whether the tomato was a fruit or a vegetable. 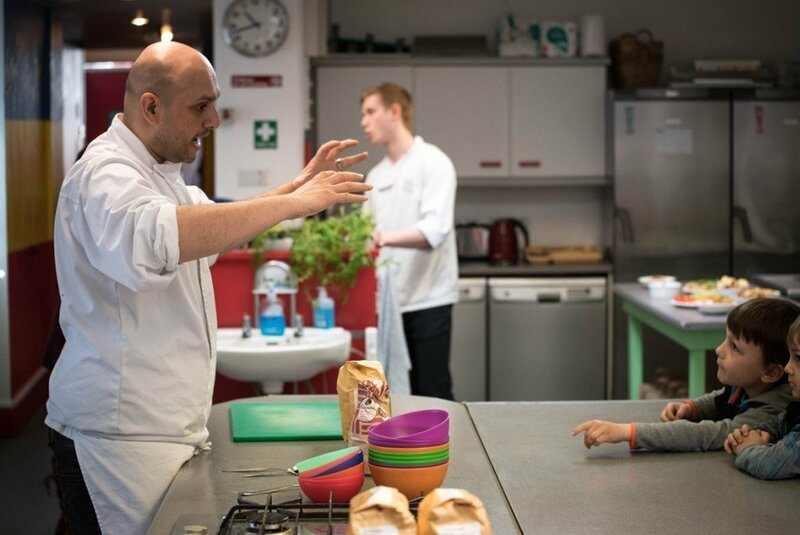 Aron wasn’t too sure of the answer, so Chef John explained that the seeds in the tomato make it a fruit. Round two and the boys were asked again whether they could guess what the item was. Aron correctly guessed that there was a bell pepper hidden underneath and that it was a fruit because it had seeds, which hadn’t occurred to me before. I always thought of a bell pepper as a vegetable! Round three and Aidan correctly guessed that there was an apple under the tea towel. 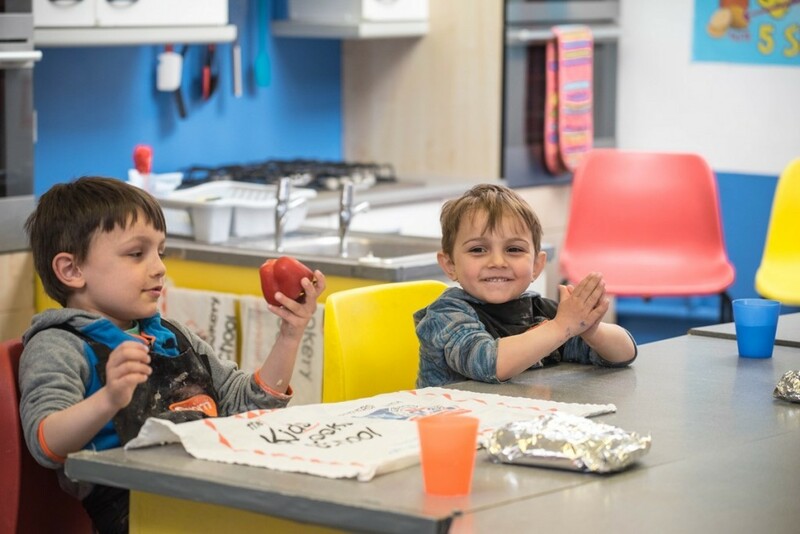 Chef John continued to teach the boys about the differences between a fruit and a vegetable and that the apple was a fruit like the banana because it lived up in the trees and not underground. 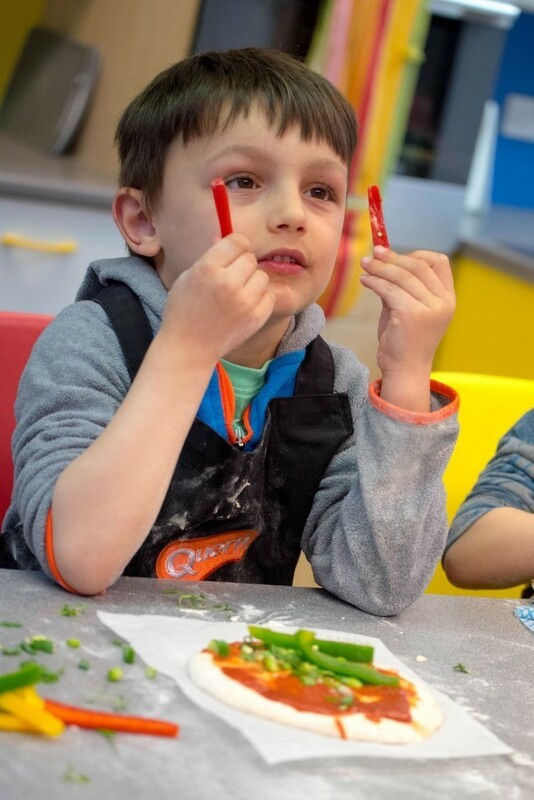 Aron also guessed a lemon and that it was a fruit and Aidan correctly found broccoli and believed it to be a vegetable because it didn’t contain any seeds. 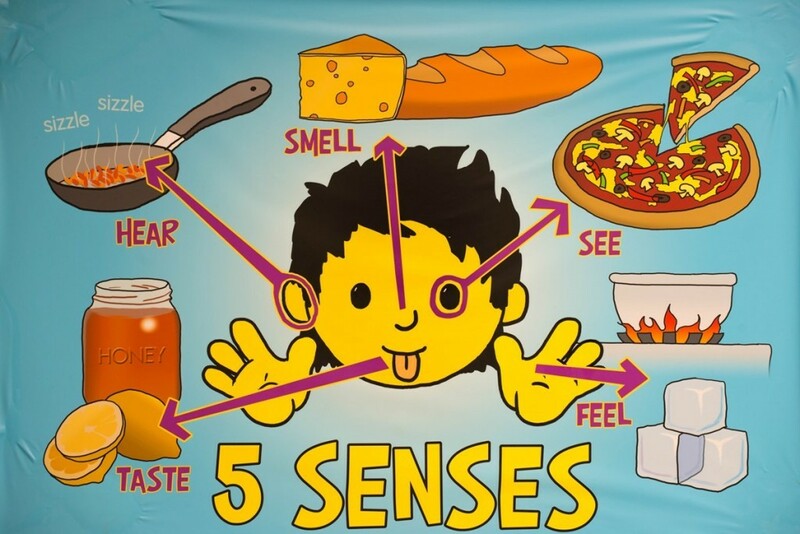 I wasn’t that surprised as Aidan weirdly loves broccoli, especially when it’s smothered in cheese. 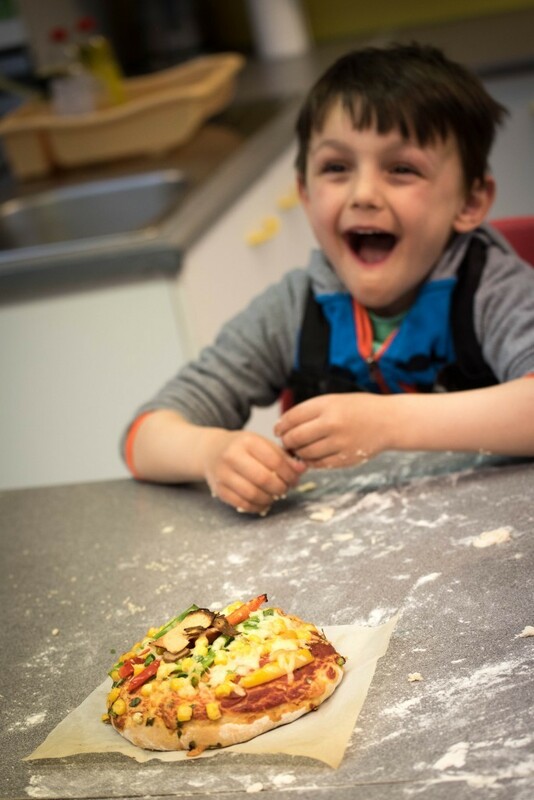 The first lesson was on making a fresh Quorn pizza, complete with pizza dough made from scratch and topped with lots of awesome veggie goodness and, of course, Quorn. 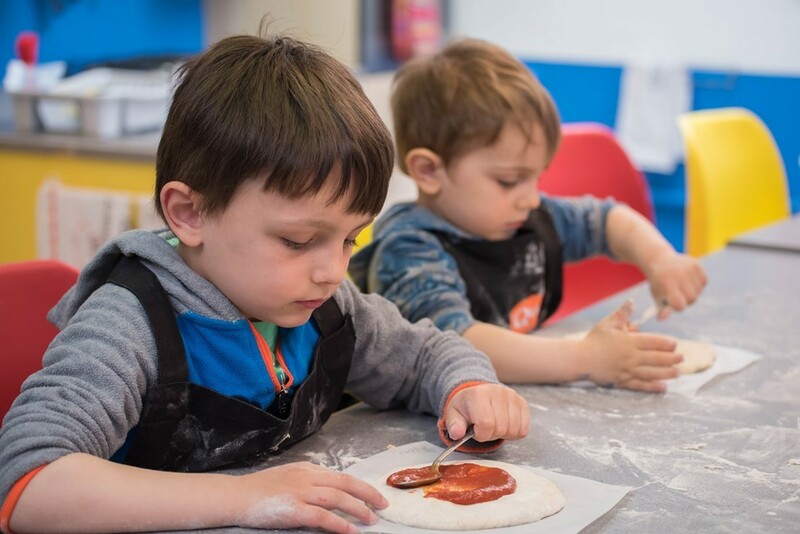 Whilst I was sipping my tea and tucking into my Quorn lunch, the boys actively engaged in the pizza-making process and thoroughly enjoyed messing around with the pizza dough. 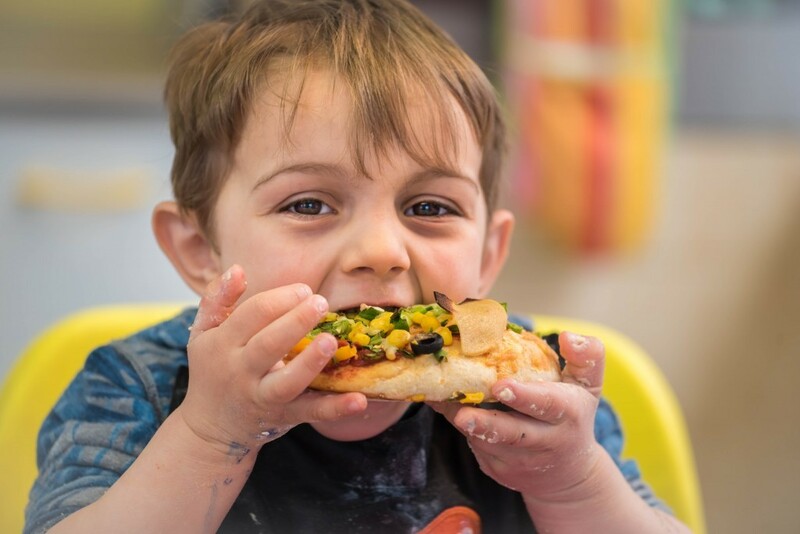 They seemed to be quite overwhelmed with the amount of pizza toppings available, but I could see that they enjoyed looking at a very colourful and inviting pizza, as opposed to the bog standard cheese and tomato they normally opt for. 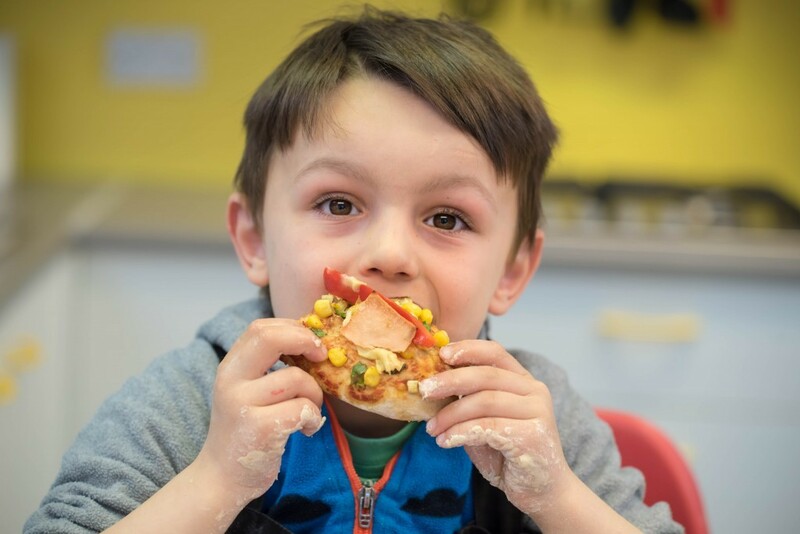 I was also pleasantly surprised that they actually enjoyed biting into their pizza creations, which contained a tower of freshly made tomato sauce, spring onions, sweetcorn, peppers, garlic, Quorn chicken, beef, and ham. 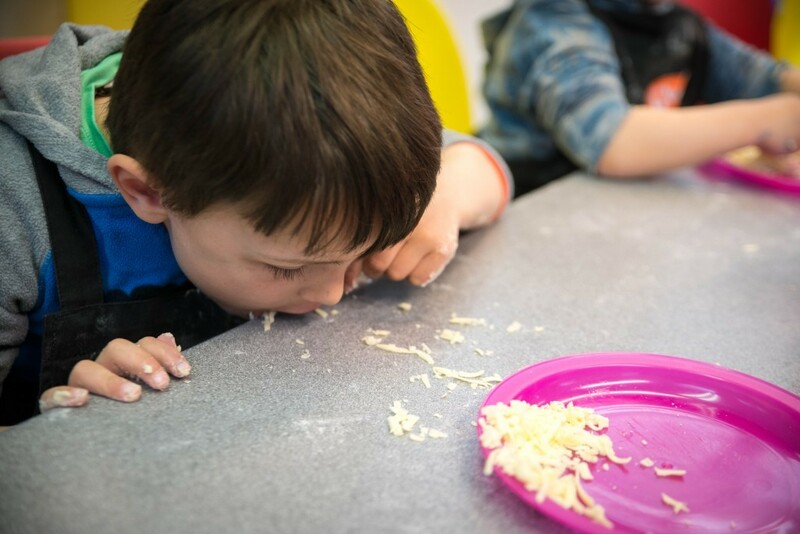 They did look so tasty! 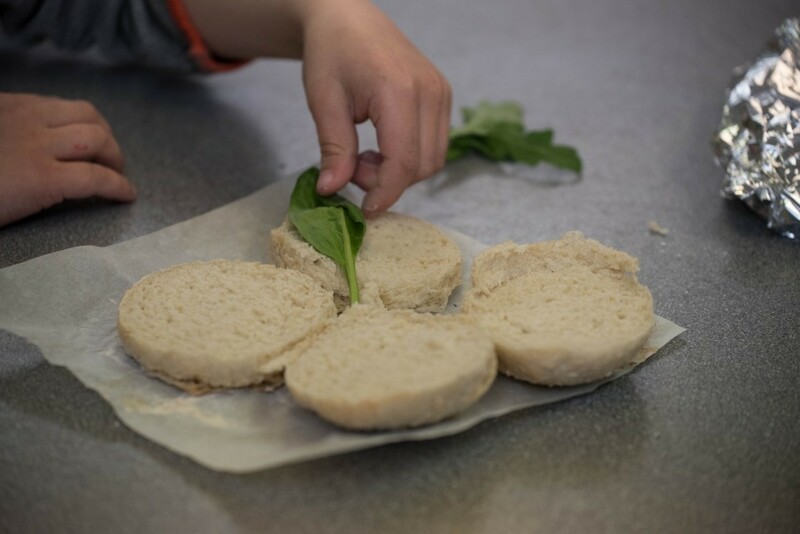 The boys stared on making the burger buns as their Quorn burgers were cooking in the oven. 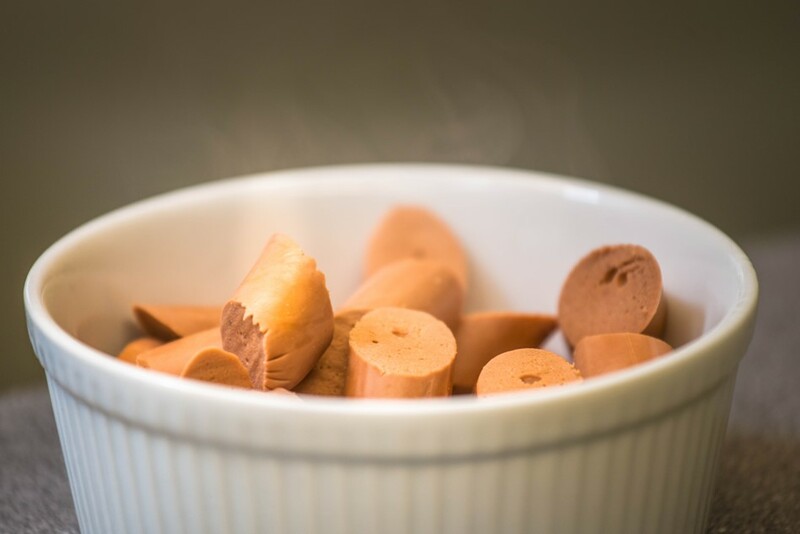 Aron is not a meat eater, so I was interested to see whether he would try the Quorn alternative. 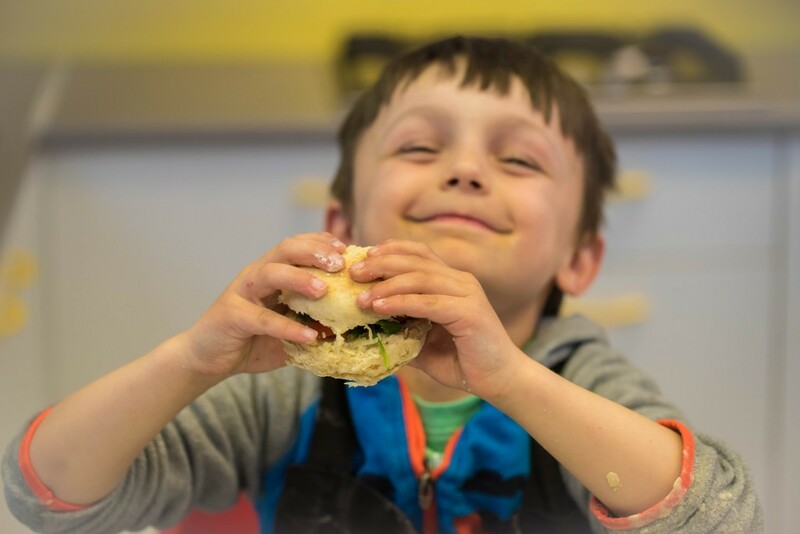 Once the bread roils were cooked and ready, the boys enjoyed garnishing their burgers with pepper, tomatoes and cucumber. 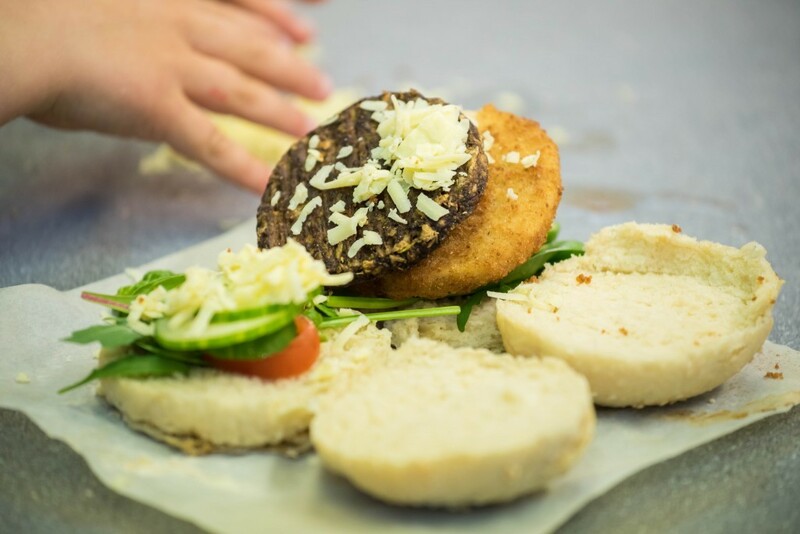 They, of course, were invited to try out their own Quorn burgers, which they also thoroughly enjoyed too. 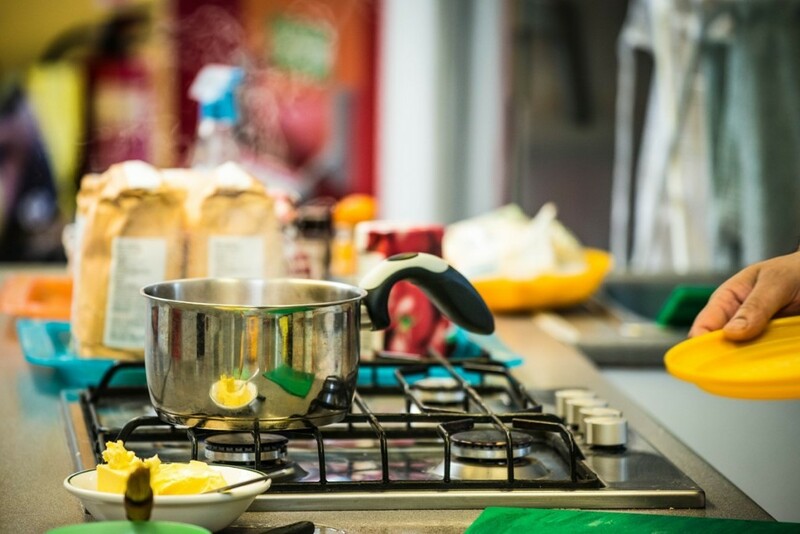 The morning cookery class was wrapping up for a break, in time to prepare for the afternoon session. But, as we had to wait for my husband, who was photographing both the AM and PM sessions, we had about four hours to kill. So, I took the boys to the local Acton park, which is a brilliant park if you ever want to burn your kids’ energy because there are tons of playground equipment available for kids of all ages. 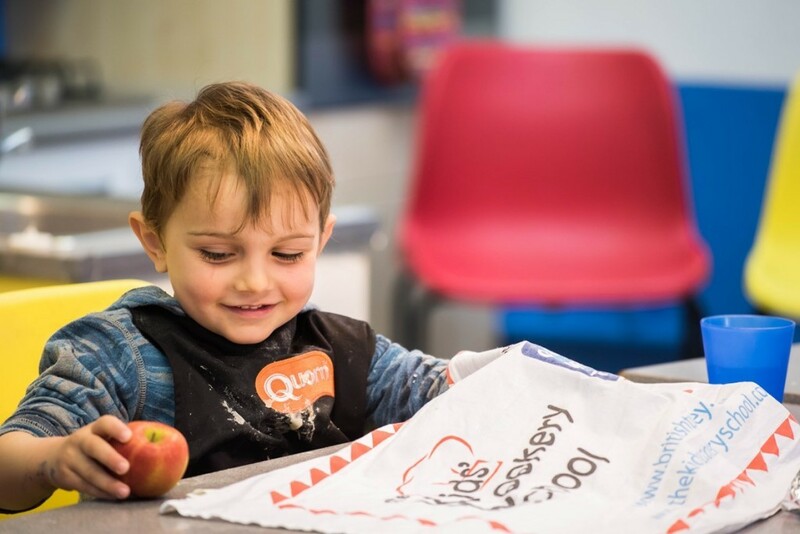 Unfortunately, it was a rather turbulent and particularly common April day (sun, wind and a little bit of rain), so we strolled back to the KCS, where we met the other blogger families, who were deep in session with the Quorn team about special diets and nutritional information on Quorn. 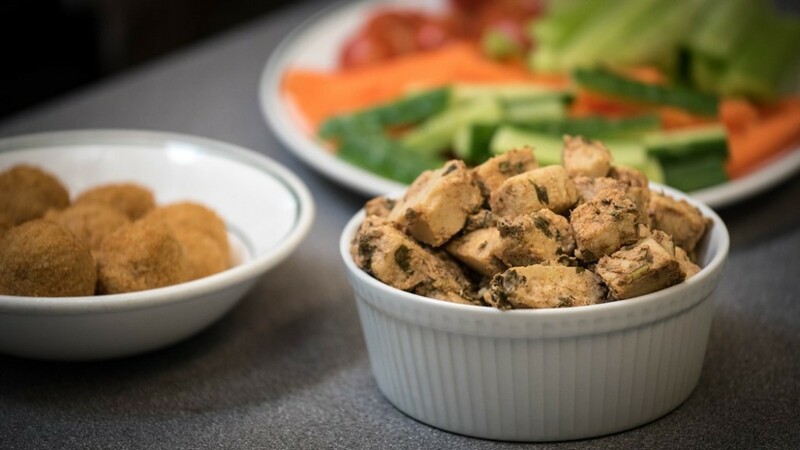 There was another great lunch laid out on the table and, as the boys and I were so famished after our three-hour park workout, we very much enjoyed a healthy and quite filling Quorn lunch. 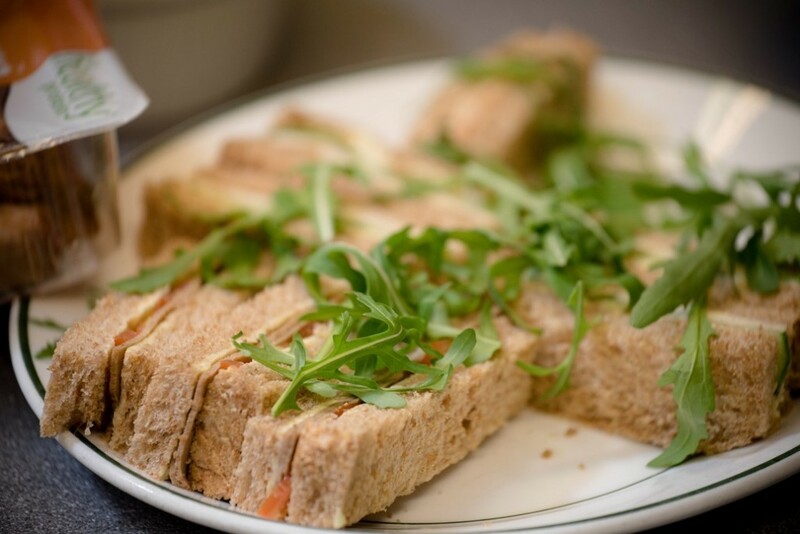 The boys even tried Quorn sausage rolls and sandwiches, as well as their favoured carrot and cucumber sticks. 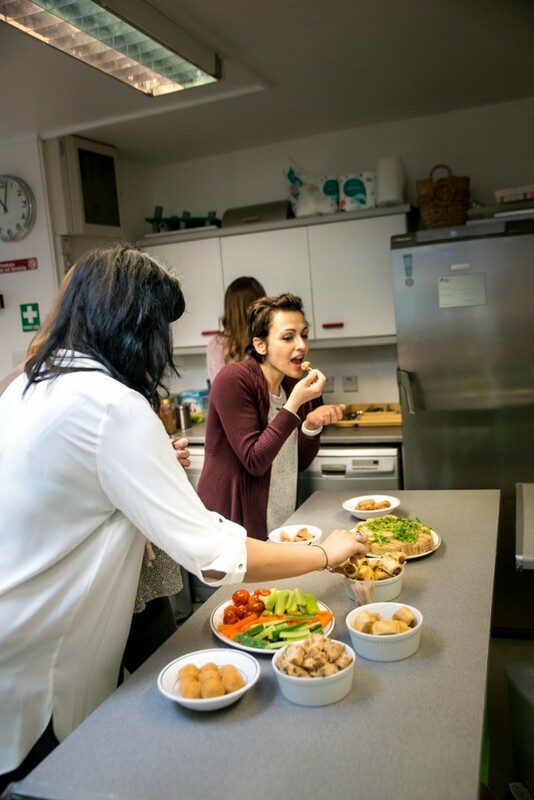 diets were when we were kids, yet it was plain to see that our unanimous objective is to provide our own kids with a varied and balanced diet, so they grow up with a healthy affiliation towards food in general. 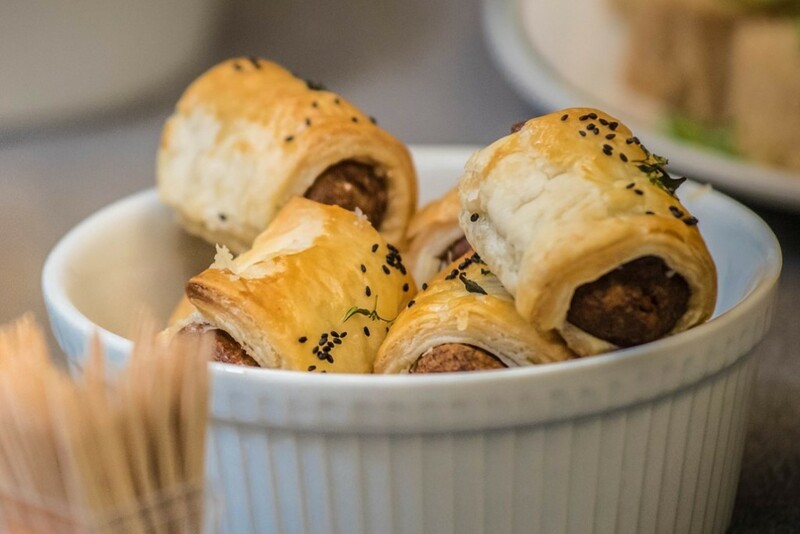 I’ve had the privilege of being able to attend a Quorn Summer BBQ Event, a Quorn cookery class (for adults), create lots of great recipes using Quorn (including my Quorn Mince Sausage Rolls and Quorn Meatballs and ‘Getti (Spaghetti)) and write about Quorn and its health benefits in general. So, I feel like I have a good idea of why Quorn is such a great addition (if not, substitution) to meat in our diet. 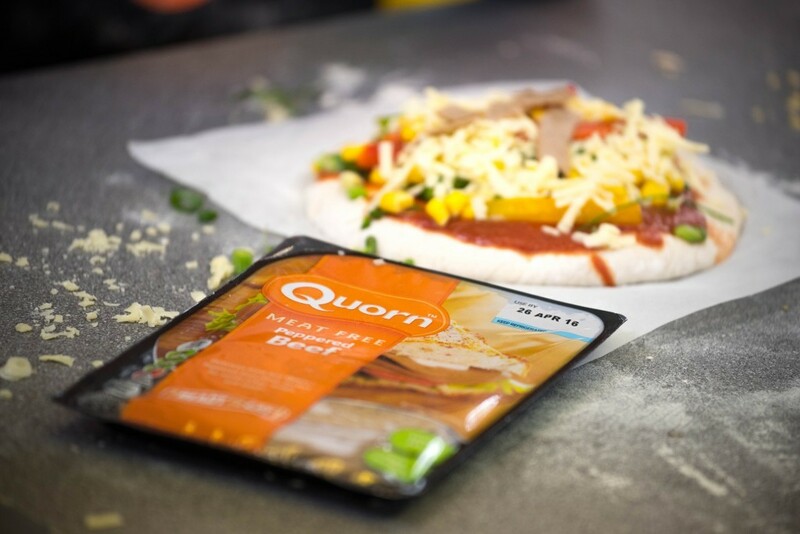 Quorn is made from a plant protein called Mycoprotein that replicates the texture and taste of meat. 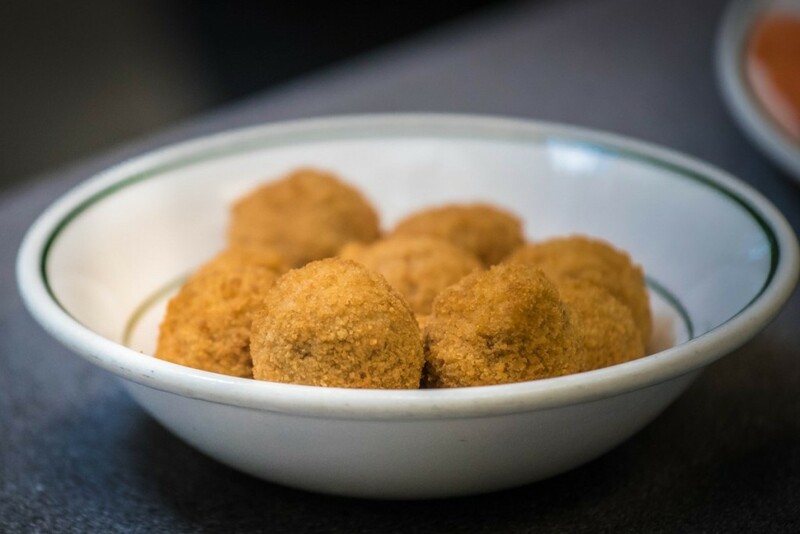 Mycoprotein is a great source of protein and dietary fibre and it’s low in saturated fat, so it helps maintain healthy bones and cholesterol levels. 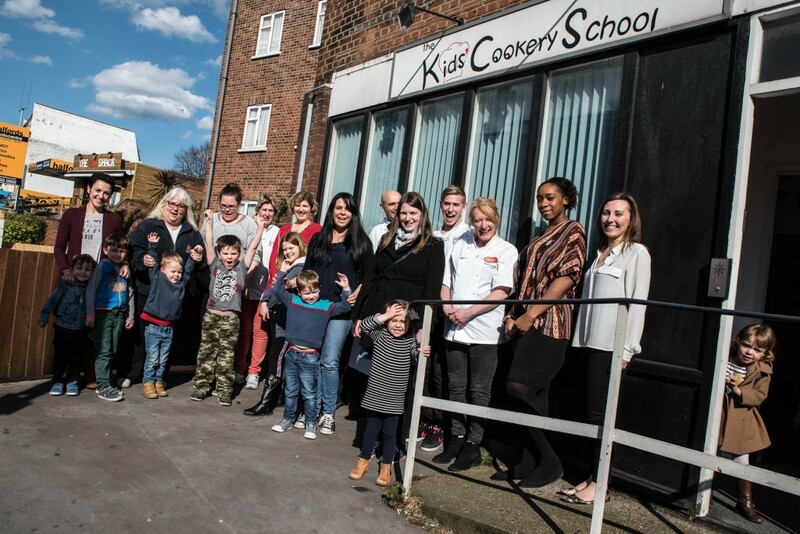 As well as Chef John, we also got to meet the rest of the team over at KCS; Fiona Hamilton-Fairley, who is the CEO & Principal, Irene Mensa-Bonsu who is Operations Manager and Fiona’s PA, and Oliver Knowles, who volunteers as a young Junior Chef in between his University studies. 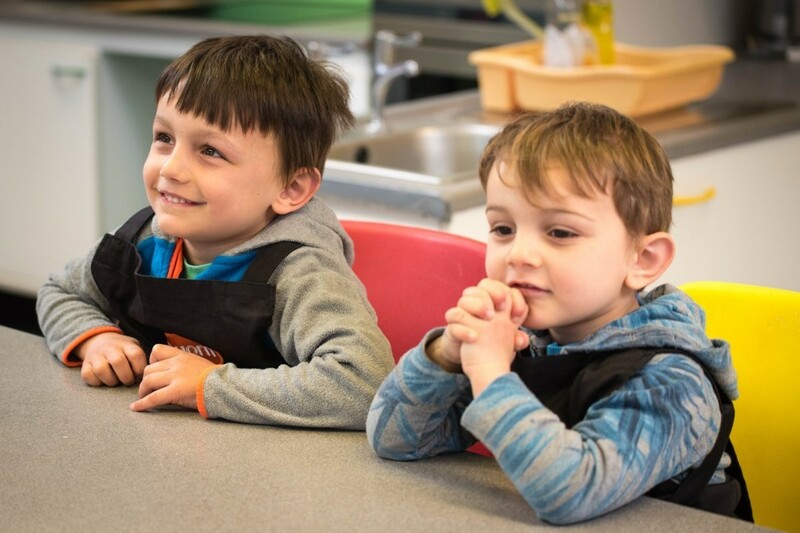 It’s clear to see that they are all passionate about helping the kids cook, which transpires clearly to the atmosphere of the kitchen. 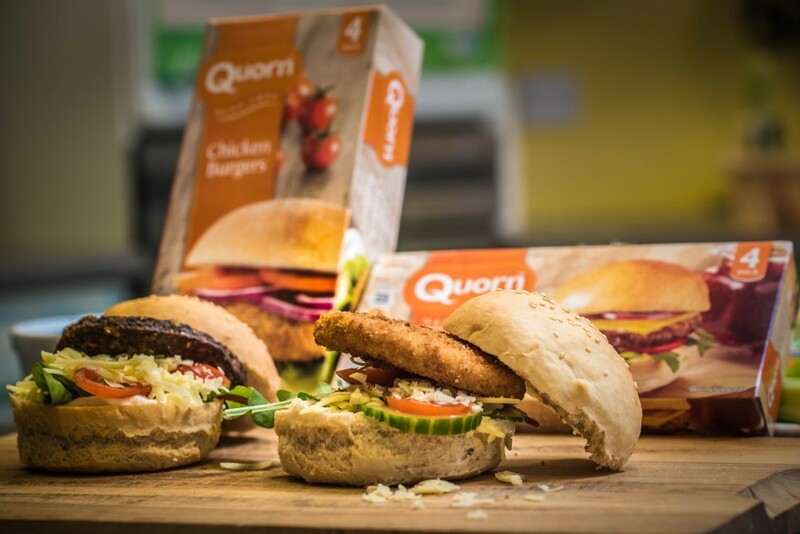 Quorn products are so versatile that you can pretty much substitute any meat recipe with a Quorn alternative and it tastes just as good. 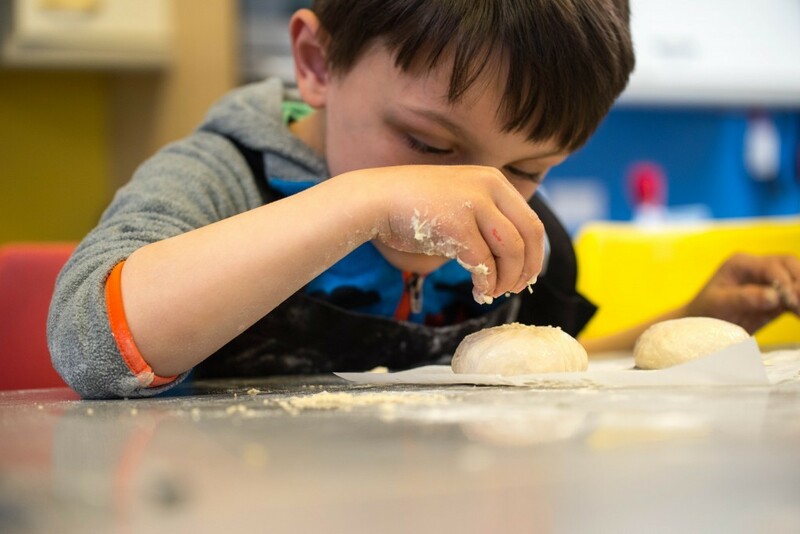 If you encourage your kids to make the food, they are more inclined to be experimental and try out their own creations, even if its drowning in lots of veg and Quorn food. The boys loved their pizza and burgers and we got to enjoy x 2 of both when we got home. 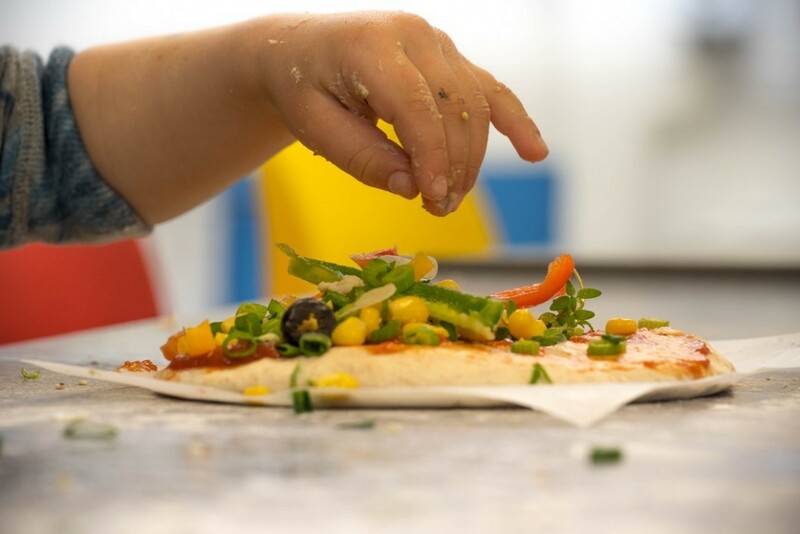 I was thoroughly impressed myself, both the pizza and burgers were bursting with flavour and far healthier for kid and adults to eat than greasy cheese and tomato pizza. 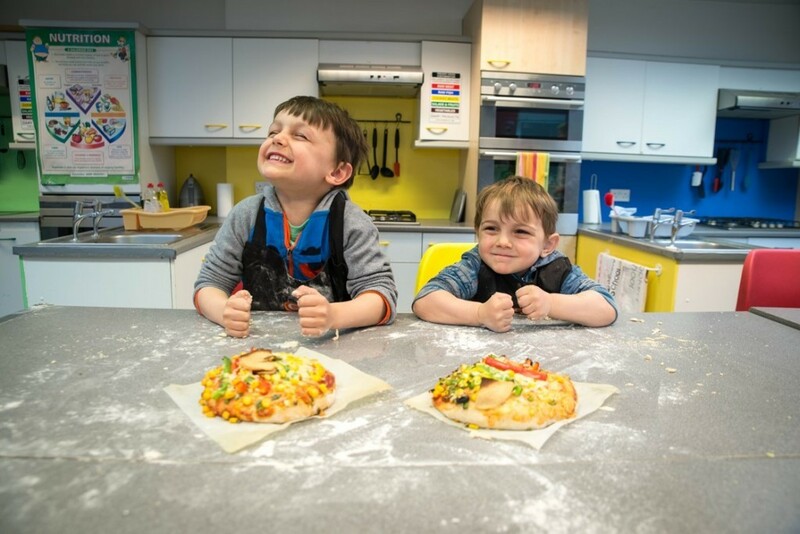 The boys took away with them some very valuable cookery lessons from KCS, like the differentiation between fruit and veg, how to make a pizza dough and how to enjoy a great meat-free burger, which is so much healthier than the fat ladened beef mince burger that’s packed with fat and cholesterol. 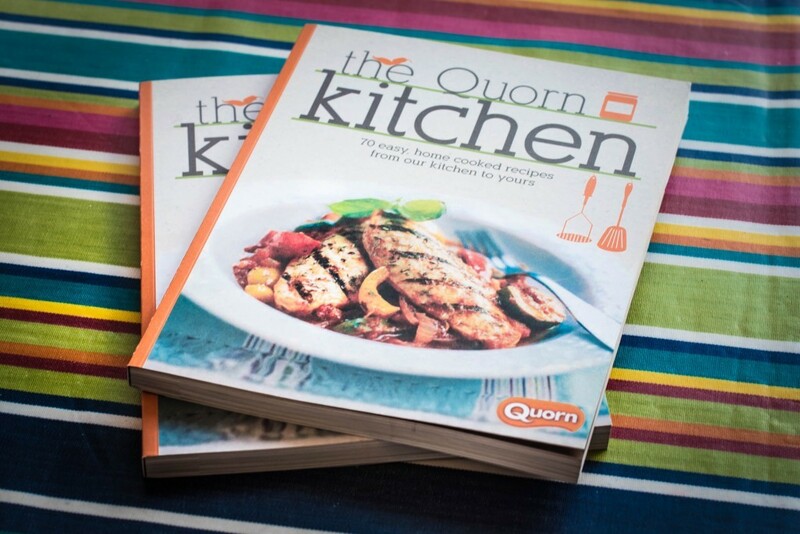 There’s a brilliant new recipe book out, which includes lots of awesome recipes on how to cook with Quorn – I want it! 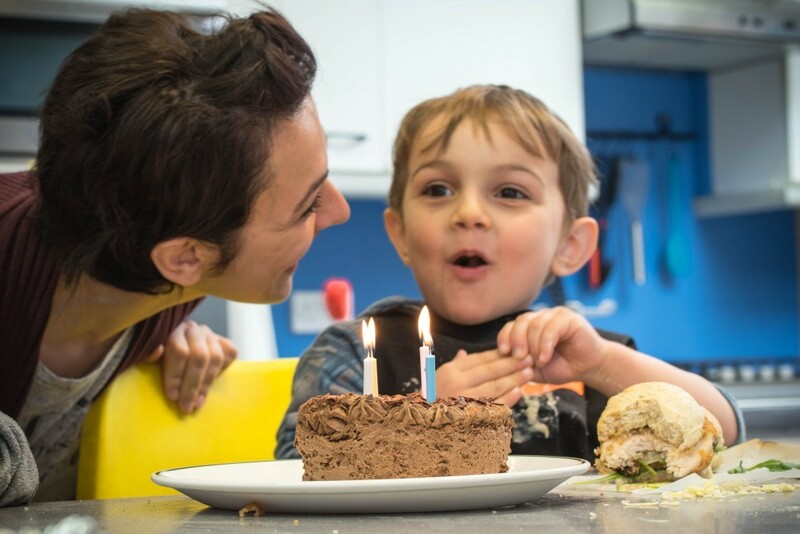 P.S – It was Aidan’s 4th birthday so to celebrate in style, the Quorn and PR team very thoughtfully brought a delicious chocolate cake, complete with candles to celebrate the occasion. What a lovely gesture, thank you so much! 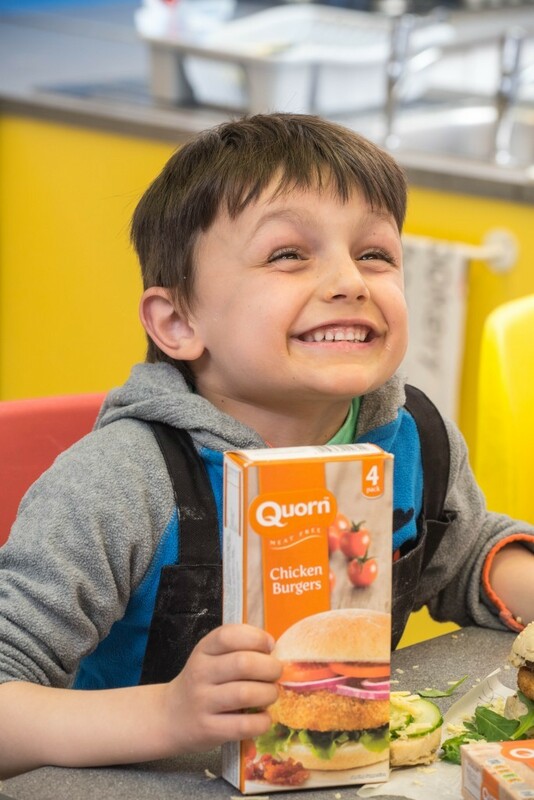 You can also read Quorn’s version of the events on their website. 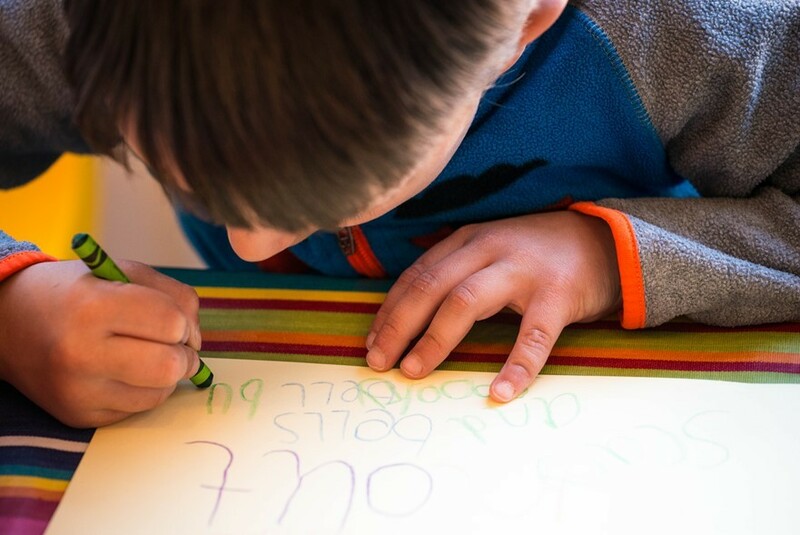 Share your wealth of experience and knowledge with our community, apply to become a Motherhood Diaries’ Contributor here. Don’t forget to read our Ad Policy.